The Micromoog is a seriously underrated vintage synth, containing virtually the same filter as the original Minimoog. And honestly, its oscillators and filter have 1000x more character than any modern Moog, including the Voyager. It's an aged, slightly unstable American VCO - powerful, rich, and capable of everything from thick and smooth to downright dirty and brash. 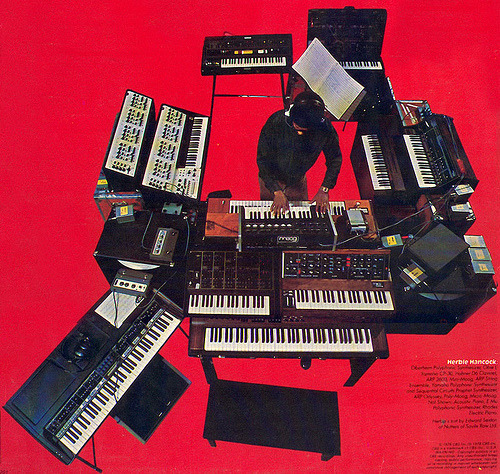 The synth's been used by Air, Stereolab, Kraftwerk, and Herbie Hancock who's seen on this album cover choosing it over some serious contenders. We captured this synth at both its cleanest and dirtiest settings, recording long modulations, sweeping filters, and as many waveshapes as humanly possible. With the help of a tape machine, various tube devices, API & Neve preamps, hardware saturation, EQ and modern moog filters, we took it out of the 70s and into new sonic territory. Once digitized, it was further transformed into a stunning soft synth, capable of gorgeous pads, classic moog leads and basses, cosmic FX, italo arpeggiators, deep house chords and more. Please note that this product comes in a choice of two formats at different price points. You can sepcify your format at checkout.